If you have followed my blog for a while you would know that Maxwell adores dressing up. Maxwell now has a whole toy box full of dressing up costumes and his box of costumes is continuing to grow. Maxwell has costumes for all occasions for the year and has costumes suitable for him to wear daily. All Maxwell's costumes are bright, fun and are costumes which he loves to wear. Recently Maxwell was given the chance to choose a new costume to celebrate the new year in. Maxwell was given the opportunity to choose a costume from the online shop Time To Dress Up. From the word go we had great customer service and were kept in the loop the whole time. We were advised about fittings and were given advice about sizing which I found to be very helpful due to the fact Maxwell has a tiny waist but is quite tall for his age. In the end Maxwell decided on a Triceratops Dress Up costume. Maxwell adored the costume due to it being dinosaur themed however as I parent I loved the costume as I thought it was practical for Maxwell to wear and was a costume which Maxwell would not grow out of easily. Once ordered Maxwell and I awaited for the costumes delivery. The delivery was fast and the costume was well packaged. Once received we were excited about dressing Maxwell up and allowing him to run around in the costume. Maxwell wanted to put the costume on straight away. In my opinion it is one of the most detailed dinosaur costumes I have seen recently and it was a costume that I was proud to see Maxwell in. The costume itself was well made, was a perfect fit and the design was fantastic and well thought out. 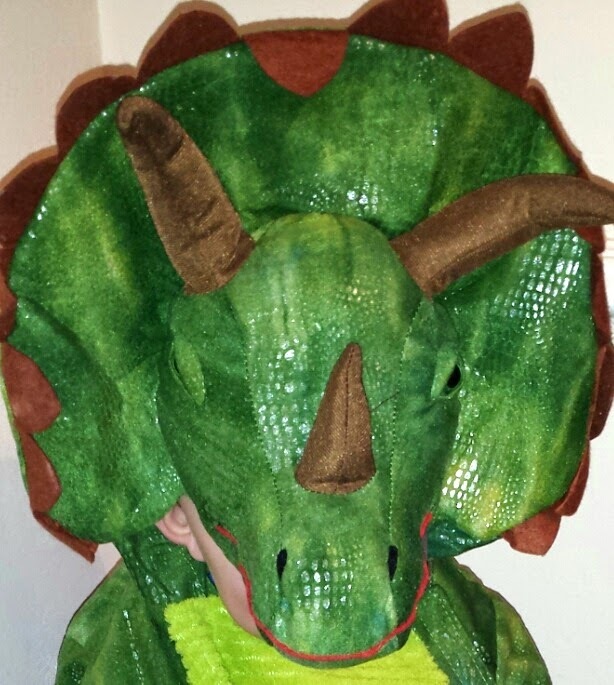 The Triceratops costume is a dark green costume and is made from a plush material. The costume features a soft tummy and a cute tail. The head of the costume includes a hood design which allows Maxwell to either have the hood up or down which I think is a great feature as often Maxwell can get hot and bothered with having things on his head. The hood has horns and spikes which I feel gives the costume a great effect. On the hands and feet the costume features soft claws, the claws are the final special touch to the costume and make it look great. The costume seems to be hard wearing and Maxwell has worn the Triceratops costume in the garden, around the home and around relatives houses. I have no negative points to make about the costume. It has become one of Maxwell's favorite costumes and Maxwell loves to roar at people whilst wearing it. Although we got the costume in age 2-3 years and Maxwell is now 3 years old, there is plenty of growing room in it yet. The costume can be bought in sizes 18 month up to 6-8 years and costs just £31 with free delivery. When Maxwell has worn the costume, he has had a lot of feedback. If you are after a eye catching costume for your child, this costume is for you. However we did receive the costume free of charge for the purpose of this review.Everything written in this post is my own, honest opinion.